German-occupied Europe refers to the sovereign countries of Europe which were occupied and civil occupied including puppet government by the military forces and the government of Nazi Germany at various times between 1939 and 1945 and administered by the Nazi regime. The farthest east in Europe the German Wehrmacht managed to occupy was the town of Mozdok in the Soviet Union; the farthest north was the settlement of Barentsburg in the Kingdom of Norway; the farthest south in Europe was the island of Gavdos in the Kingdom of Greece; and the farthest west in Europe was the island of Ushant in the French Republic. Several German occupied countries entered World War II as Allies of the United Kingdom or the Soviet Union. Some were forced to surrender before outbreak of the war such as Czechoslovakia; others like Poland (invaded on 1 September 1939) were conquered in battle and then occupied. In some cases, the legitimate governments went into exile, in other cases the governments-in-exile were formed by their citizens in other Allied countries. Some countries occupied by Nazi Germany were officially neutral. Others were former members of the Axis powers that were occupied by German forces at a later stage of the war. ^ a b Encyclopædia Britannica, German occupied Europe. World War II. Retrieved 1 September 2015 from the Internet Archive. ^ Prazmowska, Anita (1995-03-23). Britain and Poland 1939-1943: The Betrayed Ally. Cambridge University Press. ISBN 9780521483858. ^ Moorhouse, Roger (2014-10-14). The Devils' Alliance: Hitler's Pact with Stalin, 1939-1941. Basic Books. ISBN 9780465054923. ^ Goldstein, Erik; Lukes, Igor (2012-10-12). The Munich Crisis, 1938: Prelude to World War II. Routledge. ISBN 9781136328329. ^ Conway, Martin; Gotovitch, José (2001-08-30). Europe in Exile: European Exile Communities in Britain 1940-45. Berghahn Books. ISBN 9781782389910. ^ Hanson, Victor Davis (2017-10-17). The Second World Wars: How the First Global Conflict Was Fought and Won. Basic Books. ISBN 9780465093199. ^ Cornelius, Deborah S. (2011). Hungary in World War II: Caught in the Cauldron. Fordham Univ Press. ISBN 9780823233434. Gildea, Robert and Olivier Wieviorka. Surviving Hitler and Mussolini: Daily Life in Occupied Europe (2007). Klemann, Hein A.M. and Sergei Kudryashov, eds. Occupied Economies: An Economic History of Nazi-Occupied Europe, 1939-1945 (2011). Mazower, Mark (2008). 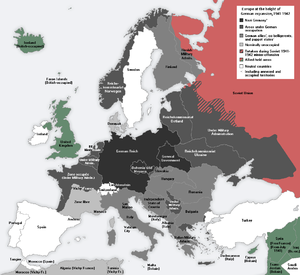 Hitler's Empire: Nazi Rule in Occupied Europe. London: Allen Lane. ISBN 9780713996814.